What are key determinants of personality development and differences? How are different personalities described? When you look up the meaning of the word personality in layman's terms, you may find something like ‘that what characterizes a person’. In everyday life we use terms such as character, identity or predisposition. Your personality does not change just from one day to another, actually it changes hardly at all. If there are any changes these are very limited and slow. If they occur they may be caused by trauma or life changing experiences. Personality can be divided into different components and characteristics. Over time, many different classifications have been made in personality characteristics. Literally hundreds! Your personality is something that you always take with you, it affects your thinking, feelings and behavior, where and with whom you are, in any situation at any time. Personality helps you to adjust. Your personality helps you to "survive" and deal with the daily challenges surrounding you. In a sense your personality is in part psychological but also physiological. Research suggests that your personality is also influenced by all kinds of biological processes and needs. A frequently asked question is: "Is personality innate or acquired?" This question is also called the nature-nurture debate. This issue has been debated by philosophers and other scientists for centuries. According to John Locke (1632-1704) and his followers, the development of personality was purely a question of 'nurture' or education. The newborn child would be like a clean slate ("tabula rasa"), which can be shaped as educators want it to be. Pendants of this vision, such as Jean-Jacques Rousseau (1712-1778), oppositely claimed that heredity has the most important influence on personality. According to Rousseau, the development of a child follows an inner, biological time table. As parents you do not play a role in this, according to Rousseau. This is probably also the reason why Rousseau sent his own children to an orphanage. Today, thanks to twins research, we know more and more about the nature-nurture issue. This type of research observes identical twins growing up separately, in different families and environments. Identical twins share 100% of their genes. When identical twins that grow up separately from each other, differ from each other on a certain characteristic, this must be due to environmental factors. We then know that that characteristic is (partly) learned. Through this kind of research it is now generally known to what extent heredity and environment influence personality. For example, we now know that characteristics such as extraversion, conscientiousness, neuroticism, agreeableness and openness are innate for about 20 to 45%. For the rest these characteristics are formed by influences from the environment, such as parents, school, friends, and etcetera. Besides influences from the immediate environment such as education and school, the culture in which you grow up also influences the development of your personality. The distinction between individualistic and collectivistic culture is particularly important. In individualistic cultures, such as the US and European countries, the emphasis is on the development of the individual. In collectivist cultures, such as Indonesia and Panama, much value is attached to the group interest. Individualist cultures stimulate the development of qualities such as self-confidence, independence and assertiveness; in collectivist cultures this is particularly true of qualities such as friendliness, modesty and loyalty. This may lead Europeans, for example, to believe that Japanese react shyly and submissive. Japanese, on the other hand, may find Europeans bold and selfish. Research2 among bilingual people shows that cultural influences partly pass through language. The personality of bilingual people also depends on the language they speak. This study looked at Mexicans and Americans who speak both Spanish and English fluently. In general, Mexicans are less extroverted, a little less agreeable and less conscientious than Americans. Remarkably, if a bilingual Mexican or American speaks English, they reacted more extroverted, agreeable and conscientious than when they speak Spanish. It appears that by speaking another language, you also become someone else. You adapt your personality to be more in line with the culture that belongs to the language you speak. The lexical hypothesis states that all personality traits have rooted in a given language. 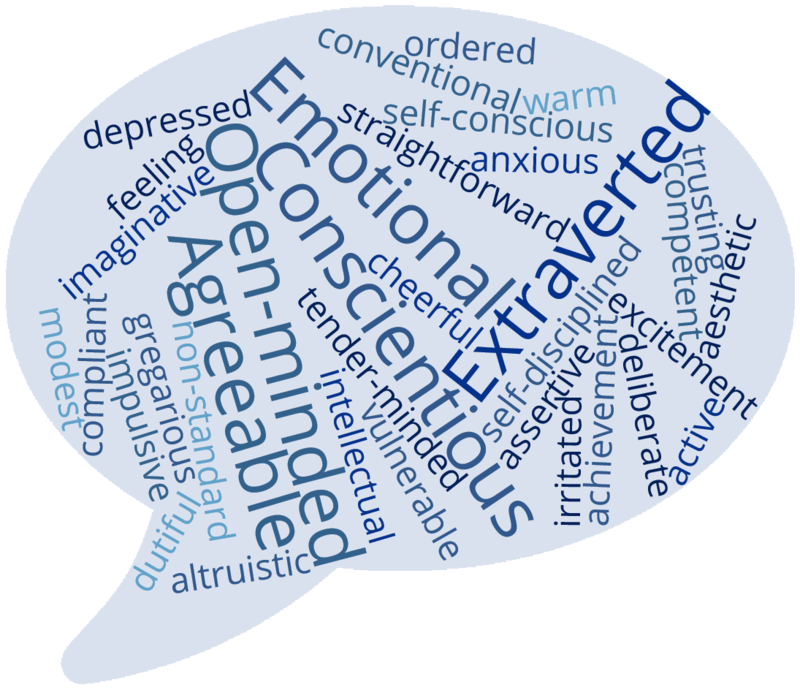 Over the course of time, people come up with words to describe personality traits and to talk about them. The lexical hypothesis therefore states that the more important a characteristic is considered, the more words (synonyms) will exist for it. By studying a language you can find out which traits matter most in a certain language area, often a country. Moreover, you can compare languages with each other. You can then find out which traits are considered important in all language regions (or countries), and which traits are seen as important in one language area but not so much in another. Researchers who take the lexical hypothesis as a starting point, are faced with a huge task. By means of dictionaries they have to try to group all words in a language that describe characteristics of people into clusters. They then do this for multiple different languages. Recent lexical research3, in which twelve languages were studied, shows that at least three clusters of personality traits arise. These are the clusters of extraversion, conscientiousness and agreeableness. In the description of the Big Five personality theory below you can read more about what these clusters exactly mean and what characteristics they include. Read more on the Big Five personality model, or take our free online personality test or career test. There are several factors that may cause personality disorders, or signal the presence or onset. Some personality traits are connected to certain illnesses neurotic personality traits and five illnesses. These are headaches, asthma, arthritis, peptic ulcers and heart disease. Shyness is supposed to be connected to a shorter life span! These are very bold statements. You should not worry about how your personality affects your health. Chances are very large that you are just perfectly fine and that your personality shapes you as the unique person you are. If you want to test your personality profile take this personality test. No obligations! 1 Larsen, R.R., & Buss, D.M. (2018). Personality Psychology: Domains of Knowledge About Human Nature. 2 Ramírez-Esparza, N.,Gosling, S.D., Benet-Martínez, V., Potter, J.P., & Pennebaker, J.W. (2006). Do bilinguals have two personalities? Journal of Research in Personality, 2, 99-120. 3 De Raad, B. et al. (2010). Only three factors of personality description are fully replicable across languages: A comparison of 14 trait taxonomies. Journal of Personality and Social Psychology, 98(1), 160-173.